We’ve had a small troll infestation for years. These diminutive pests cause nothing but grief so we put them to use. From their home in Scandinavia, they brought us Kveik yeast. This strain produces bold citrus peel esters, which are accentuated by the massive amounts of Galaxy hops used to dry hop this beer. Exploding with flavours of pineapple, lychee, guava and grapefruit, Troll Juice is an incredibly crushable beer. Enjoy this hazy, fruity, spicy IPA and remember to FEED THE TROLLS! 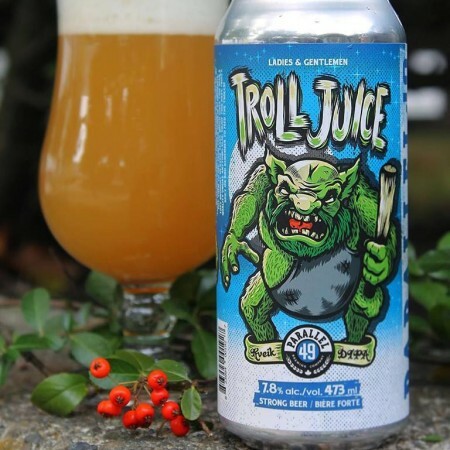 Troll Juice was released last Friday at Parallel 49 in 4-packs of 473 ml cans and on tap. Cans will also be available soon at select liquor stores in British Columbia and Alberta while supplies last.